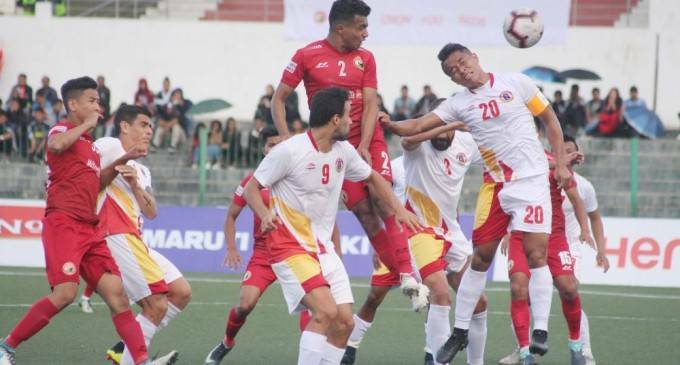 Kolkata giants East Bengal produced a second successful professional performance away from home, emerging 3-1 winners over Shillong Lajong in the I-League here Thursday. In game eight of the 12th Hero I-League, EB rode on a first-half brace by Kerala striker Jobby Justin and a second-half strike from Bidyasagar Singh to thwart a spirited Shillong side, which got one back in the second half through left wing back Rakesh Pradhan. Shillong’s football remained attractive, dominating and flowing, but the inexperience of having nine, U-22 players in their XI showed up eventually, after a fluent 2-0 win against Aizawl FC at home last week in their opening game. EB go on top of the league standings with two crucial away wins to kick-start their campaign, after having beaten NEROCA FC 2-0 in Game Week 1. Alison Kharsyntiew, the Shillong coach, began with an unchanged starting XI while EB’s Spanish coach Alejandro Menendez Garcia chose to begin with Brandon Vanlalremdika in midfield in place of Yomi Longwah, who had started in their opening encounter. Shillong were on the ball from the word go as captain Samuel Lalmuanpuia’s super strike off a free-kick in the danger zone outside the box, ricocheted off the EB woodwork with goalkeeper Rakshit Dagar soundly beaten. Quite against the run of play though, it was EB who took an early lead. From Lalrindika Ralte’s left-footed free-kick, Kerala frontman and Hero of the Match Jobby Justin leapt up to connect with a perfectly placed header, which beat Neithovilie Chalieu in the Shillong goal. The goal spurred the Shillong players and they put the EB side under sustained pressure with a wave of attacks. Samuel Lyngdoh’s crisp strike from 25 yards out in the 23rd minute was blocked by Dagar and captain Lalmuanpuia’s punch after Kamalpreet had given the ball away inside the EB half, were notable in this period. There was a spell when Shillong forced three corners in the space of 15 minutes but could not find the equaliser. It was then in the 41st minute when Jobby helped EB double the lead from a counter attack. Mexican Enrique Esqueda who had a relatively quiet game, entered the box and his attempted cross hit a Lajong defender and looped up into the box. After the break, Shillong carried on with their attacking forays. Lyngdoh created and missed the most for Shillong but he overall had a good game. In between EB missed a couple of chances through Brandon and Laldanmawia Ralte. In the 71st minute, Shillong got a goal back when the tireless left wing-back Rakesh Pradhan rose to connect a perfect header off a Hnamte corner. Shillong’s joy was short-lived however as EB struck again a couple of minutes later through substitute Bidyasagar Singh.